That's 27 fake stores so far. The number's actually expected to grow. Back in May, Steve Ballmer claimed that piracy robbed Microsoft of 95% of its revenue in the country. Well, it turns out that Apple's sorta having the same problem: Fake Apple Stores are cropping up all over the place. Last month, Web surfers were surprised to learn that fake Apple Stores were starting to pop up over in China. 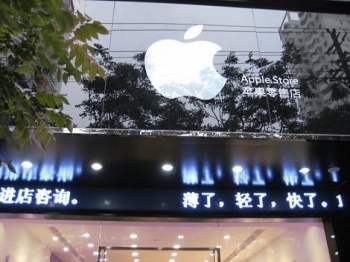 Reports were coming in that at least five convincingly fake Apple Stores could be found in the city of Kunming. Not only did they look like the real thing, but a lot of the employees actually believed they were working for Apple. At first, Apple didn't appear all that concerned about these shops. After all, they were selling official Apple merchandise, so (theoretically) the company was receiving the profits from selling these goods to the stores. That said, two of the shops were shut down because the owners didn't have business licenses. When news of the fake stores reached Apple's headquarters in Shanghai, complaints started being made to Kunming authorities. Basically, Apple's primary problem with he stores was that they were using official Apple logos without permission, making them look like the real deal. An investigation was launched by officials on August 2nd, and "a further 22 store were found to be selling either official or counterfeit Apple products under the guise of being an official store." Exactly how these stores will be dealt with remains to be seen. Technically, they should be shut down, as China has laws in place that protect trademarks and prohibits companies from copying "the look and feel" of other company stores. However, as Reuters points out, "In May, China was listed for the seventh year by the U.S. Trade Representative's office as a country with one of the worst records for preventing copyright theft."